Hello - I will go directly to why I'm writing you. My husband and I purchased an antique children's chair at an auction in December 2014. A dealer friend, who also attended the auction, confirmed that it was made in the 1850's, probably in Georgia. I placed it in a corner of our living room when we got home. That night, we heard dragging sounds in the hallway outside our bedroom door. My husband cautiously walked to the door and peeked into the hallway. The chair we had just purchased was set against the opposite hallway wall. He turned and looked at me like he had just seen a ghost! I got out of bed and walked through the doorway into the hallway. I touched the chair, which was ice cold. We brought it into our bedroom and tried to go back to sleep, but spent most of the night wondering aloud how the chair got upstairs. Nothing else happened that night. At the breakfast table, we discussed what had happened. My husband carried the chair downstairs into the dining room, and it set there while we discussed the strange circumstances. We decided to place it back in the corner of the living room. The next morning, I came downstairs and immediately noticed that the chair was missing. When I walked into the kitchen, the chair was sitting upright on the kitchen table. There was also dirt and soil scattered on the table and floor. I was really spooked at that point! My husband decided to take the chair to work with him. For a few days, he kept it in the SUV. He then carried it into his office and placed it in a far corner. For several weeks there was no activity. One Saturday morning, my husband went to the office to collect documents he needed to bring home. When he walked into his office he noticed that the chair was missing. He looked throughout the building but it was no where to be found. He started to make his way to the parking lot and noticed that the chair was sitting beside his driver side door. He placed the chair in the SUV and brought it home. When he got home he carried the chair into the garage. For almost 3 months, the chair remained in the garage in the exact spot my husband had placed it. One Sunday afternoon a few weeks ago, I thought that I'd try and bring it back into the house and place it in the living room corner. I had bought the chair to fill that spot and I wanted it to stay there. Maybe it would stop it's wandering about and remain where I put it. Everything was fine for two days, until I came home from shopping in the evening and noticed that the chair was missing. It's been three weeks and we have no idea where the chair has gone. We have looked everywhere. I even went back to the auction house and looked around, just in case the chair returned there. I didn't say anything to anyone at the auction house for obvious reasons. I recently became a subscriber to your newsletter, so I decided to write you in hope of receiving some answers. Your readers may also have some suggestions. 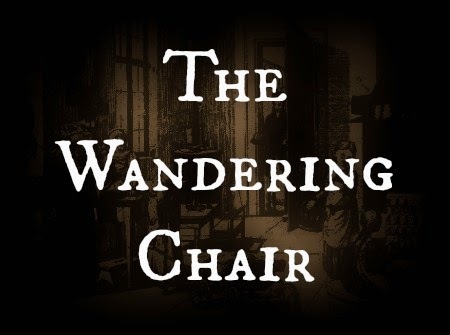 About the moving chair or anything else that doesn't stay put, I think it would be interesting, if it's found, if a tracking device would work on it. See where it migrates, if that's possible. Why when I read this post do I feel so sad for this chair? ?